As I have mentioned before, we have two dogs. Lizzie (on the left) and Grace (on the right. For those who believe dogs are dogs and have no people-like tendencies, just skip this entry. 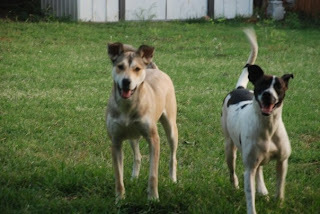 These dogs are stricken with personality all over and oddly enough one favors my husband and the other favors me. Just as Randy and I are not like the rest of the world, well neither are out dogs. With that said, Grace still seems to amaze me sometimes. In our large backyard lined with a privacy fence, there has never been a hint of them getting out or even wanting to get out. As weather and age do, though, wood can wear out after a while. In the corner, without a gate, a couple of panels had started to crumble and with a little help from doggy noses looking through the holes, they just came down the other day. So, what does Lizzie do? Nothing. She looks out for squirrels on occasion, but she has remained within the confines of our yard. It might be argued that she is just too big to fit through the whole, but I don't think so. She's big and strong. If she wanted out, she could make it through. Now, what does Grace do? She marches herself through the whole to greet the blue yonder of freedom never to be seen of again??!! No, she marches through the whole and stays just on the other side of the fence. Sniffing around at the leaves and the neighbors air conditioner, she doesn't even make it to the front yard. Getting around to fixing the hole just hasn't been top priority, plus I thought I had scared her enough then to make her not try it again. Unfortunately, that was not the case. This morning Grace slept in until about 9:30. When I finally let her out, not 10 minutes later I called them for breakfast. Lizzie trots in, happy as a lark, but no Grace. Yeah, here we go again. This time I was mad. I had to go put decent clothes on, shoes and a jacket. When I finally opened the front door to track her down, I didn't even have to leave the house. There she was sniffing around the front walk, shivering the moment I opened the door. She knew she was in trouble. What possesses a dog to get out but not really get out? If it were me, I'd make the breakout worth my time and run up and down the street or something!